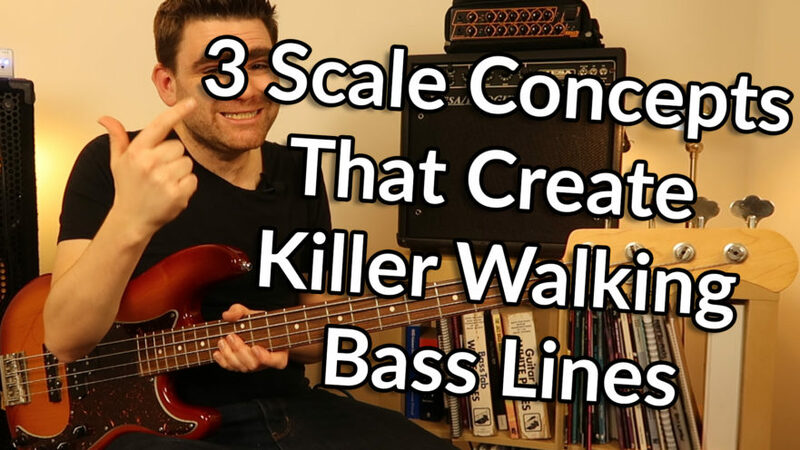 Click Here To Download The FREE 3 Scale Concepts That Create Killer Walking Bass Lines PDF! Welcome to Part 2 of the Walking Bass Series. In this bass guitar lesson I'm going show you 3 scale concepts that create killer walking bass lines. Creating walking bass using scales can be tricky because it's hard to get the notes within the scale to line up perfectly with chord changes. Often we need to 'manipulate' how we play the scale so scales sound 'strong' and outline the chords well. What's more scales in isolation can tend to sound like a technical exercises. This bass lesson shows the secrets of how to create musical walking bass lines using 3 simple concepts derived purely from the first 5 notes of the major and minor scale. Make sure you check out Part 1 of The Walking Bass Series where I introduce this concept and the other two core methods of creating bass walking bass lines. For this lesson I'm going to use the first 8 bars of the well know jazz standard Autumn Leaves. This chord sequence is based on a concept called the Circle of 5ths or the Cycle of 4ths (two names for the same chord thing!). First, let's comfortable with the chord sequence by just playing the root notes on the bass guitar. It's really good to internalise sound of the chord sequence or 'harmony'. A great way of doing that is to play the chord sequence on the bass guitar. Here is the sequence played using some common 'voicings' or chord shapes on the bass guitar. To get further help with chords on the bass guitar make sure you download the Essential Guide To Bass Guitar Chords here. In this first concept I'm going to extend the Whole | Half | Half Method which we discussed in part one of The Walking Bass Series. Notice how we can start to use the whole range of the fingerboard. Over the first 4 bars this line starts off at fret 3 on the A string and ends at 12 fret on the G string. This is why learning walking bass can be so powerful for your fingerboard knowledge and confidence. As the name suggest this method comprises of a Whole Step (2 frets) , then two Half Steps (1 fret) to travel from chord to chord. In bar 5 we adapt this to Half Step, Whole Step, Half Step. This is to get the bass line to work with the Am7b5 chord. The beauty of this concept is you do not have to worry about if the chord is major or minor. This is because the bass line has bother a major 3rd and a minor 3rd in it. They effectively 'cancel' each other out and end up creating a great sounding Jazz walking bass line. In this second concept I'm going to a very simple concept that just using the first 3 notes of the Major or Minor scale. To ensure the bass line always lands on the target note (or the first beat of the next bar) at the correct point we are going to double root. This means the root is played twice on beats 1 and 2. We then ascend up the 2 notes of the scale. The major chord or 7th chord will use a major third and a minor chord will use a flattened / minor third. Go through this concept very slowly to begin with and listen to the sound of each bar, one by one and appreciate the critical differences in the bass line. Bar 5 uses the pattern R, R, b2, b3 to get the bass lines to work perfectly with the Am7b5 chord. In Concept 3 I'm going to show a very simple but powerful Walking Bass concept. First of all we need to be comfortable with the idea of 'Target Notes'. When creating walking bass lines we always need to have a target note. More often than not the target note will be the next chord change. If we are playing the Cm7 bar our target note with F, which is the first beat of bar two. The Scale Wrap Around plays note below the target note and note above the target notes on beats 3 and 4 of the previous bar. Again the challenge is picking is to ensure we are playing the correct minor or major 3rd in each bar. You will also find that root of the Major Chords is best played with 2nd finger on the fretting hand and the root of the minor chords is best played with a first finger on the fretting hand. The patterns of notes will then fall natural under the hands if you are using the One Finger Per Fret Method. Mastering these 3 straight forward concepts over this Circle of 5ths Chord sequence will unquestionably help you take scales from being a 'academic' technical exercises to something you can use in the real world with confidence. In part 3 of The Walking Bass Series I'm going to show how to take the ideas you learning in walking bass. If you love Funk Music... watch out! If you'd like to learn walking bass from the ground upwards make sure you check out The Essential Walking Bass Cours over in the Bass Lab PLUS Membership. You can also grab the backing tracks for this lesson inside the membership too. You can request your invitation by clicking here - ebassguitar.com/blp.